Our Enfield dog walking service offers daily dog walking services in the following local areas of Enfield: Enfield Chase, Enfield Highway, Enfield Lock, Highlands, Southbury, Enfield Town and Turkey Street. If you need a dog walker in Enfield, look no further. 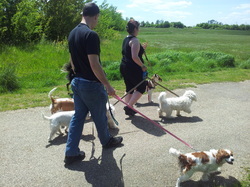 Primo Pet Services is Enfield's top choice for professional dog walking. Our dog walking service can be catered to your needs by our reliable, experienced and fully insured small team. We are not an agency and instead pride ourselves on providing a quality service. We offer group walks for up to 5 dogs per handler (depending on dog size and temperament we usually walk smaller groups) for just £10 per hour. All you have to do is call Sarah on 07872518558 and a member of our small team will visit you and your dog to discuss your requirements. There's no minimum booking - you can use our service as much or as little as you like and can even provide last minute care for your dog. Assessments take on average an hour where we will bring another friendly dog to make friends with your dog and fill out some basic forms for insurance purposes. Clients are more than welcome to meet us on one of our group walks Monday to Friday!